The RV Atlantis II was a purpose-built oceanographic vessel for Woods Hole Oceanographic Institution (WHOI) under a $5 million grant from the National Science Foundation. The ship was built at the Maryland Shipbuilding and Drydock Company in Baltimore, MD and was launched in 1963. 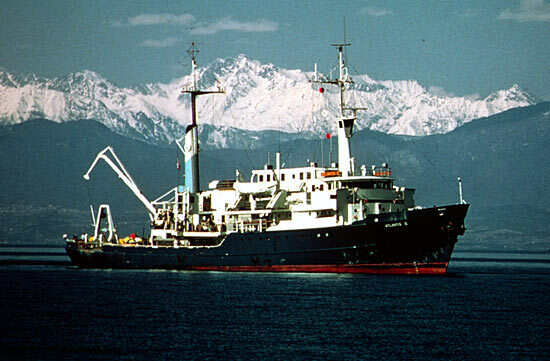 Atlantis II was named after WHOI's first research vessel, the Atlantis, a 142-foot steel-hulled sailing vessel which is depicted in the Institution's logo and which retired from service in 1964. Atlantis II, was considered the flagship of the WHOI fleet and was the first vessel to get the RV designation. The ship is 210 feet long with a beam of 44 feet and a draft of 17 feet. It cruised at 12 knots, and could stay at sea for 45 days. It could accommodate 25 scientists and had a crew of up to 33. The ship traveled around the world many times and was involved with every type of ocean science exploration. No other oceanographic research vessel has covered a much of the ocean as Atlantis II. It has sailed more than 1 million miles (1,006,912) on 458 cruises and spent 8,115 days at sea in every ocean of the world, a record unequaled by any other research vessel. The Atlantis II visited 112 ports in 78 nations and hosted thousands of visitors from many nations, including notables such as Vice President Hubert Humphrey in 1967, Japan’s former Crown Prince and now Emperor Akihito in 1987, and the explorer Jacques Cousteau. In 1979 Atlantis II underwent a major mid-life refit. The conversion of the vessel’s power source from steam to diesel reduced the vessel’s operating cost, increased its range of travel, and increased its selection of ports. In 1983 a deck hanger and A-frame were installed enabling her to handle the launch and recovery of the deep submersible research vehicle (DSRV), Alvin. Atlantis II served as Alvin's tender from 1984 to 1996. A notable point of interest is that Atlantis II was one of the first research vessels to take women scientists to sea, as well as the first to employ female officers and crew. It also set the Institution’s record for number of days at sea with one particular voyage of 575 days and 73,907 miles covered. Atlantis II was decommissioned in 1996 after a remarkable 33 year career.